The Ord East Kimberley Development Package is being funded through a collaborative partnership between the Australian and Western Australian Governments, involving a total investment of $415million between 2009 and 2012. The project will include the release of 8,000 hectares of agricultural land, in conjunction with the improvement of social, community and common-use infrastructure. 1. 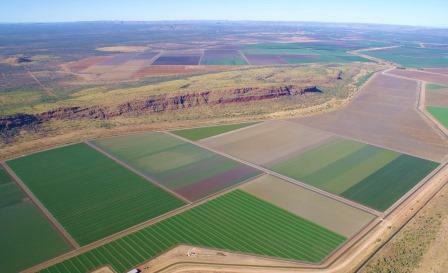 East Kimberley Development Package (EKDP) â€“ $195 million from the Commonwealth Governmentâ€™s Nation Building stimulus package to partner with the Stateâ€™s investment to ensure that the social and community infrastructure and services keep pace with the growth resulting from an expanded agricultural base. 2. Ord Irrigation Expansion Project (OIEP) â€“ $220 million from the Western Australian Governmentâ€™s Royalties for Regions fund – This contribution will be used to fund the construction of physical infrastructure such as irrigation channels, drainage and roads, and create the farmlands. The project is being managed by the Department of Regional Development and Lands and LandCorp in conjunction with a range of State Government departments and agencies. Four proponents have now been shortlisted and invited to submit full tender proposals for the delivery of roads, channels and drainage for the 8,000 hectares of farmlands in the Weaber Plains area. The State Governmentâ€™s land development agency, LandCorp, will be responsible for the land release and tendering process for the sale of land to the national and international market.â€¨â€¨If you would like to register your interest for sales updates visit the LandCorp website.